Two former Californian cops have been acquitted of the murder and manslaughter of a homeless, mentally ill man in July 2011. Kelly Thomas, who was schizophrenic and living in southern California, was approached by Fullerton police in a bus depot parking lot after reports emerged that somebody had been rattling car doors. In a disturbing video revealing extreme police brutality, several officers, including the two on trial, Manuel Ramos and Jay Cicinelli, beat Thomas and used a Taser on him as he cried out for his father and for help. The FBI announced Monday that it will begin an investigation into case evidence to “see if further investigation is warranted.” This follows disbelief at the verdict of a case that shocked the nation two and a half years ago, when the details of the case emerged. While the question of what actually killed Thomas was highly contested during the trial — the defense focused on his previous methamphetamine use, which a forensic pathologist says enlarged his heart— Thomas’ death five days after being beaten into unconsciousness was considered due to asphyxiation from injuries sustained at the hands of police. Former officer Ramos was acquitted of second-degree murder and involuntary manslaughter, and his ex-colleague Cicinelli was acquitted of excessive force and involuntary manslaughter. The jury deliberated the case for two days, and agreed that the Ramos and Cicinelli were just trying to do their job. Afterwards, jurors swiftly exited the courtroom and did not comment on the case. The video below shows the incident; it is graphic and disturbing, so please consider before watching. Outside the courtroom, Kelly’s family were shaken and stunned, and spoke with reporters. "I'm just horrified. They got away with murdering my son," Cathy Thomas, the victim's mother, told reporters. Ron Thomas, the victim’s father, said that the verdict was “carte blanche to police officers to do whatever they want,” and labeled it a miscarriage of justice. “They had no malice in their heart,” John Barnett, an attorney for Ramos, told CNN. He added that the officers were doing what they were trained to do. The death of Kelly Thomas is the latest incident illustrating the increasing criminalization of homelessness and growing violence towards people living on the streets. A recent survey from Florida reports that 44 percent of homeless women and 34 percent of homeless men in South Florida have been victims of violent attacks. Federal statistics have indicated the close link between homelessness, mental illness and incarceration, with 15.3 percent of jail inmates reporting homelessness at some point in the year before being locked up. 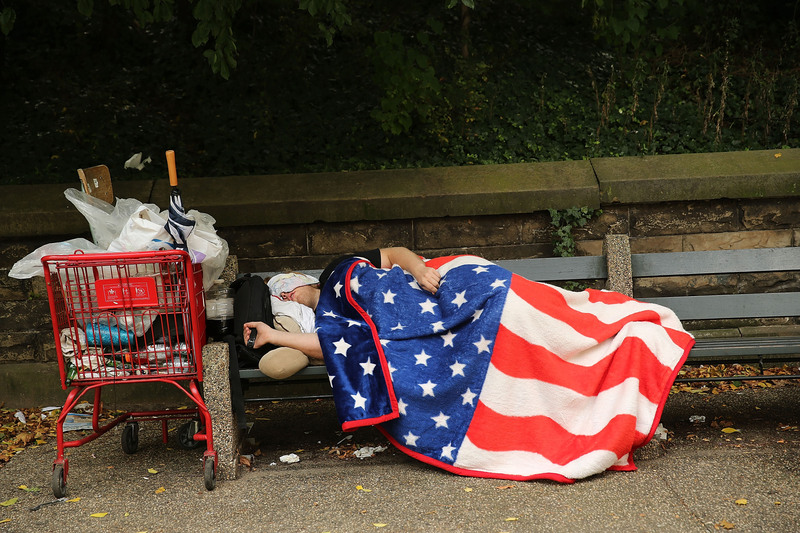 Many American cities are cracking down on attempts to help out, whether it be feeding people in public places or sleeping outside — even despite the rise in homelessness. Columbia, the capital of South Carolina, recently moved to essentially criminalize homelessness. And the city of Houston, Texas has passed a set of laws that make it much more difficult for charitable groups to feed the homeless, requiring them to ask permission of the city before serving food in parks, and limiting the number of times food is served.